Source: Produced in E. coli. E. coli DnaJ is fused at the N-terminus to a His-tag. Formulation: Liquid. In 25mM HEPES, pH 7.5, containing 200mM potassium chloride, 10% glycerol, and 5mM DTT. Scientific Background: Escherichia coli heat shock protein DnaJ belongs to the molecular chaperone class of proteins. Located in an operon with dnaK, theE. coli dnaJ gene shares sequence identity with eukaryotic cytosolic and endoplasmic reticulum DnaJ homologs (Hsp40) involved in protein folding, membrane translocation of newly synthesized proteins, and initiation of translation. The N-terminal, highly-conserved "J" domain of the DnaJ protein supports interaction with the DnaK protein and represents the signature sequence of DnaJ family members. Bacterial DnaJ protein acts synergistically with bacterial chaperones DnaK (Hsp70 homolog) and GrpE in various functions, including suppressing eukaryotic and prokaryotic polypeptide aggregation to promote protein folding, facilitating protein translocation through intracellular compartments or protein secretion , and repairing and reactivating partially aggregated enzymes such asE. coli RNAP and luciferase. In these reactions, DnaJ protein facilitates the binding of DnaK to its substrate by accelerating DnaK-catalyzed ATP hydrolysis to produce a DnaK-ADP form with a higher affinity for certain protein substrates. Some eukaryotic homologues of DnaJ also display an ability to stimulate the ATPase activity of Hsp70 proteins, including DnaJ homologue S. cerevisiae YDJ1 which interacts with DnaK homologue Ssal to stimulate its ATPase activity. Data suggests that DnaJ protein acting alone possesses chaperone activity, demonstrating an ability to bind tightly to denatured proteins such as rhodanese or luciferase to prevent their aggregation or misfolding. SDS-PAGE analysis: Lane 1: MWM, Lane 2: 0.5µg, Lane 3: 1µg, Lane 4: 2µg, Lane 5: 5µg DnaJ Recombinant Protein. 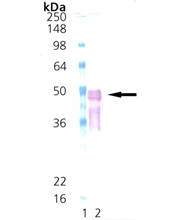 Western Blot Analysis: Lane 1: MWM, Lane 2: 100 ng of DnaJ probed with DnaJ pAb.